Dublin, Ireland and San Jose, CA: 10 August 2015— NVMdurance is demonstrating a new NAND flash SSD reference design that extends the life of flash memory up to 7 times at the Flash Memory Summit at the Santa Clara Convention Centre, August 10-13, 2015 (booth 829). 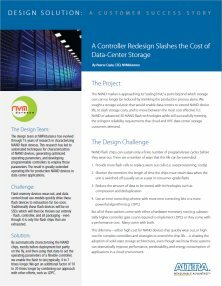 The FPGA-based SSD reference design enables data center operators to leverage the most advanced TLC and 3D NAND technology without the long design cycles required with ASIC designs. The reference design is based on the Altera Arria® 10 SoC. It implements Mobiveil’s PCIe and NVMe components and features NVMdurance Navigator NAND management software which increases the effective life of the TLC NAND parts by a factor of seven. NVMdurance will be showing data flow to and from the Arria 10 development board as well as the operation of the flash, with and without NVMdurance Navigator software. The demonstration will be at the NVMdurance booth #829 and also at the Altera booth #486.